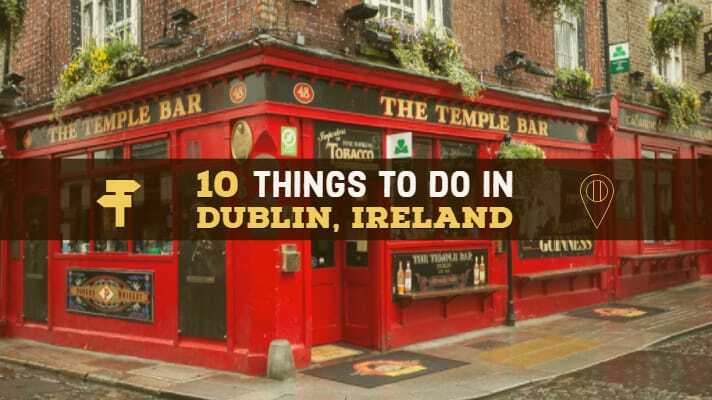 There is a lot of fun things to do in Dublin. If you are travelling to Ireland, chances are you will be landing at Dublin airport. Dublin is one of the best cities to explore in the country. Dublin along with Cork, Galway, Belfast and Killarney, is one of the most popular places to visit in Ireland. If you are looking for a place to stay, make sure to check out Airbnb for the best accommodation options across Ireland. Located close to the city centre, the Guinness Storehouse is one of the most popular places to visit in Dublin. This famous tourist hotspot in Dublin attracts thousands of visitors year round. Start your journey at the bottom of the world’s largest pint and make your way up to the top to taste the delicious beer and enjoy the views. Guinness Storehouse was one of my favourite things to do in Dublin Ireland in December. This famous Dublin Street has many excellent bars and restaurants; Temple Bar street seems to be the most popular place where tourists meet locals. This street is always busy, and there is no complete Dublin tour without visiting this part of the city. Situated in Dublin, Phoenix Park is one of the largest enclosed recreational spaces within any European capital city. The Phoenix Park was first established in 1662 by one of Ireland’s most illustrious rulers, James Butler, Duke of Ormond, on behalf of King Charles II. Now the park is home to the Dublin Zoo, a cafe, the house of the President and 100’s of deer. The Kilmainham prison is one of the largest unoccupied gaols in Europe, covering some of the most heroic and tragic events in Ireland’s emergence as a modern nation from the 1780s to the 1920s. The museum has lots of educational stories from within the jail and the political history of Dublin. Take an early tour to avoid crowds. The historic campus, located in the heart of Dublin City is renown worldwide. The college was founded in 1592 by Queen Elizabeth I and is widely considered to be the most prestigious university in Ireland. The Library of Trinity College is a legal deposit library for Ireland and the United Kingdom, containing over 6.2 million printed volumes and significant quantities of manuscripts, including the famous Book of Kells. The College offers a gift shop, cafes and bars for visitors. The Cathedral is the National Cathedral of the Church of Ireland and serves as an attractive architectural and historic tourist attraction in the country. Built in honour of Ireland’s patron saint, St Patrick’s Cathedral is one of the most important historical landmarks in Dublin. This Cathedral is beautiful, and a should be on everyone’s ‘things to do in Dublin’ when visiting the city. Here you will find St. Patrick’s Cathedral opening hours. Croke Park is the stadium where Ireland’s two national sports, hurling and Gaelic football are played. If you can score some tickets you will be rewarded with thrill and atmosphere you won’t experience elsewhere! Discover the Glasnevin Cemetery famous graves. This Dublin place is stunning filled with Irish Celtic crosses and unique history. Glasnevin Museum is the world’s first cemetery museum where visitors can explore the history and the lives of more than 1 million people that are buried here. To find out Glasven Cemetery opening hours and tours go here. Chester Beatty Library classifies as one of the best museums in Europe, and the library is a must-see in Dublin. It is the only institution in Ireland to win ‘European Museum of the Year’ and be in the top 5 of TripAdvisor’s list of ‘Top things to do in Dublin’. Make sure to visit Chester Beatty Library roof garden when here. This place belongs to my ‘things to do in Dublin for free’, and here you will find Chester Beatty Library opening hours. Dublin’s National Botanic Gardens are open year round with free admission every Sunday. This excellent place features an incredible display of flowers and plants and is perfect to visit any time of the year. They hold 20,000 living plants and many millions of dried plant specimens. The gardens participate in national and international initiatives for biodiversity conservation and sustainable development. For more information visit their official website here. I hope that whenever you get to visit Dublin that you have an incredible time. Dublin is one of those amazing cities that you won’t forget in a hurry. I also highly recommend you have visit Cork, Galway and Belfast if you can. I also always use World Nomads when travelling around the world. Their service is excellent, and they will cover you even if you are already on the move! Like what you are reading? Pin it for later! Are you going to visit Cork? Make sure to read my 10 amazing things to do in Cork.